The demand for RAE Trust services and expertise is continually growing. Requests for RAE's expansion increase as the programme becomes more widely known. A growing number of government and non-government organisations, as well as pastoralist groups, have recognised RAE's tangible impact on improving drylands, and requested for an expansion of the RAE programme to other dryland areas. RAE's expansion to date has been relatively small scale, primarily in Baringo, but also in Laikipia. RAE has also impacted other dryland areas through the increased distribution of grass seed. To enable RAE to expand on a larger scale would involve enhancing RAE's capacity, not only by improving financial support and funding, but also by upgrading infrastructure, human and technical resources. • Land Reclamation: Assessment and implementation of appropriate land reclamation techniques for different areas and communities. 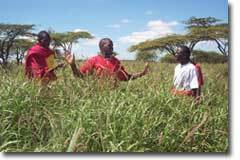 • Training: On-site training, focusing on how to enhance the productivity and profitability of drylands through sustainable management and utilisation. 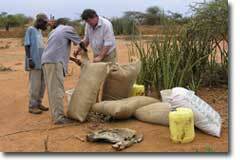 • Grass Seed and Trees: The sale of a variety of indigenous dryland grass seed and tree species. • Research Opportunities: Working in partnership with RAE on practical, field research, as well as the consolidation and analysis of extensive long term data. • Consultancies: Dryland development expertise covering an array of social and environmental topics, such as reclamation, gender, income generation, land reform, etc. Plans to expand the RAE programme are already underway, through an increase in collaborative partnerships and the application for improved funding. This is not only vital for RAE as an organisation, but also essential for meeting the need to replicate RAE's successful initiatives in other dryland areas. Funding is, however, unpredictable, and may also be made available for certain aspects of the programme, rather than the programme as a whole. One such example is training, with an interest shown by various national and international institutions and Universities to establish RAE as a 'Dryland Research and Training Centre'. The RAE Package: The concept of the RAE Package is to make RAE’s long term practical experience and expertise more widely available on a commercial basis. The RAE Package consists of four interrelated components or phases: Assessment, Training, Reclamation and Monitoring. RAE’s long term experience has proven that sustainable results can only be achieved if all four components are completed. Degraded land cannot be successfully reclaimed without thorough assessment of varying conditions in different areas, but reclamation itself is of no value unless sustained by local community groups. RAE is currently finalising the package, and exploring its marketing potential with partners interested in RAE's expansion and replication. For successful expansion the whole package of all four components is essential, involving the practical results, expertise and knowledge that have taken RAE over two decades to develop. 1) Assessment: Careful assessment of the particulars of each different degraded area through environmental and socio-economic surveys. 2) Training: On-site training as well as training courses in Baringo regarding sustainable management principles and ways of generating income from reclaimed land. 3) Reclamation: Reclaiming degraded land by planting RAE trees and grass seed. 4) Monitoring and Evaluation: The monitoring and evaluation of the programme by RAE staff and trained personnel from the area and/or organisation, defining lessons learnt to revise or expand each programme as necessary.